Keep Rockin' with Friends with Flair on FRIDAY!!! Here is 2 sketches 4 You weekly sketch. It was the basis for my card. I found this stamp at hobby lobby the other day and just knew how great it would go with my guitar from my October Kit of the month from Unity. I used SU and Basic Grey paper. I tried out my new ColorBox chalk inks which I found at Tuesday Morning for 99. What a bargain! I ended up buying every color they had which was 10 pads. Full size pads for 99 cents you just can't pass that up. The next day I went to Hobby Lobby where I picked up this cute stamp and bought two Basic Grey collection packs, Lemonade and Lime Ricky for only $9-. Yes another bargain!!! Just gotta love bargains. Design Team call with a little Basic Grey to mix it up! 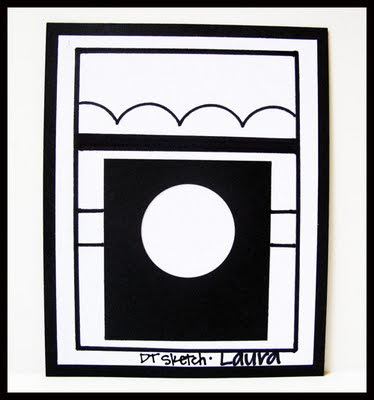 Here they are.... the sketches for the 2 sketches 4 you design team call. This is what I came up... my first card I used my Folk Inspired set by Unity Stamp Company. I also used my Lemonade Basic Grey paper for all but the stamped image which is stamped on white and colored with my copics. I then took one of my inchies and stamped that and colored that and adhered it with pop ups. 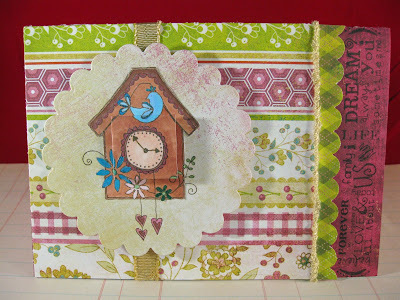 I also cut out the whole clock and glued it the patterned paper from Basic Grey. I used some of my copic spica glitter pens and other gel pens to give it a little more bling. 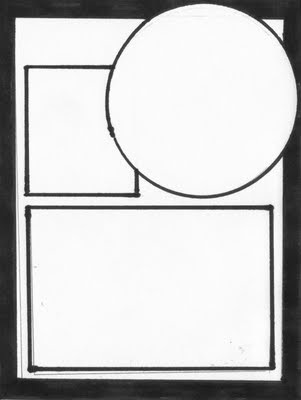 I am also entering this little card into the Basic Grey challenge. They are having a color challenge. Use Red, Blue and Green. Can you see the sparkly pens I used for the detail? What do you think? Here is my other card. I really wanted to use fabric on my cards so I decided to use it on my elephant. 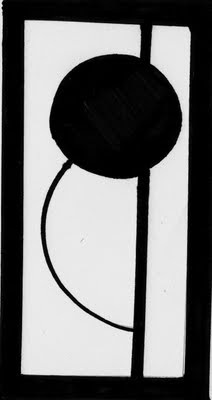 I used my Papertrey Ink Bitty Baby stamp set. My background is Worn Dots from Unity. I am really lovin' this set lately. My paper is all SU along with my ribbon, brad and punch used. The twine was thin but I twisted it 3 times to make is thicker. I am really happy with how this card turned out. I plan on making a set of thank you cards with the elephant as part of a gift for my cousin-in-laws who are having a baby. You always need thank you cards when your first baby arrives right? I'm sure they will love them which makes it that much more fun to make. Here is a close up of the elephant. The ear is fabric that looks like news print. 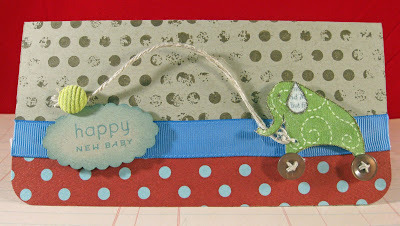 And of course a close up of the Happy New Baby, also from the Bitty Baby set. Well there you have it. My 2 cards that I submitted to the DT call. I hope you like them.